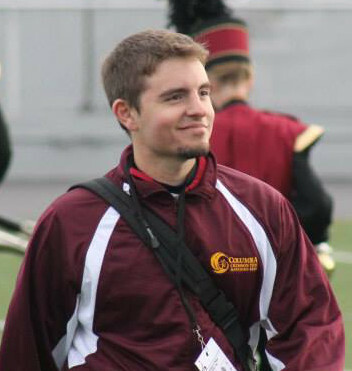 Congratulations to Aaron Magaro (BME '11), who has been named the recipient of the 2015 Outstanding Young Music Educator Award by the Pennsylvania Music Educators Association (PMEA). Aaron was honored during the PMEA Awards Breakfast on Saturday, March 28 as part of PMEA's annual conference in Hershey, Pennsylvania. This is the second year for the Outstanding Young Music Educator Award which was created to recognize and honor a PMEA member for excellence in music education who has been teaching between three and five years. Aaron is band director at Columbia Junior/Senior High School in Columbia, Pennsylvania. He began teaching there in August 2012. His duties there include directing the middle and high school concert bands, leading the competitive Crimson Marching Band, and rehearsing and directing the jazz band, chamber ensembles and group lessons. He’s also involved with creating and developing a middle and high school guitar curriculum and ensembles. “In his short tenure at Columbia, Aaron has established himself with his colleagues and the administration as an individual who takes his responsibilities very seriously and with a great deal of commitment to the students he serves. He has quickly risen to be one of the most impactful and effective teachers in the building with a set of standards that rival the most seasoned teacher,” said Brian T. Schell, Director of Curriculum & Instruction, Columbia Borough School District. “Aaron is just the kind of educator that we want representing PMEA now and in the years to come. He is knowledgeable, caring, talented, and has already taken an active role in the organization having volunteered to serve as the public relations coordinator for District 7,” reported Gregory Hutchison, instrumental music teacher, Lower Dauphin Middle School. Aaron is also a graduate of PMEA’s first Leadership Academy program (2013-14) and served as the 2014 All-State Concert Band coordinator and co-host. Aaron is currently working towards his Master of Music Education degree at West Chester University.